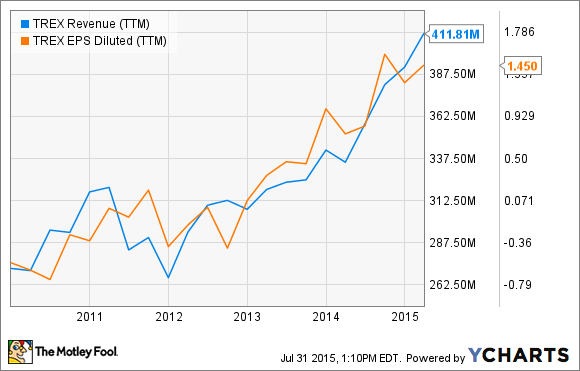 Trex Co. Inc. Moving From Turnaround to International Growth? The decking company will soon announce its last quarter under the CEO responsible for turning its around. What can investors expect? Trex decking was recently used for a six-mile boardwalk in Dubai. Source: Trex. It's hard to understate just how important CEO and board chairman Ron Kaplan has been to Trex Co. (NYSE:TREX) since taking over in 2008. Trex was in shambles, facing legal problems, a once-in-a-generation recession that was centered around the company's target market (housing), and buried in debt. The company that will report on August 3 is far removed from the one Kaplan took over, with its financial troubles and quality issues long over, and the housing market gaining steam after a historical crash and a slow-to-materialize recovery that's been years in the making. August 3 will mark the last quarter the company will report under Kaplan's watch, as he officially retires as CEO in mid-August. And as much as it's moved forward, there are potentially even bigger challenges and opportunities on the horizon. 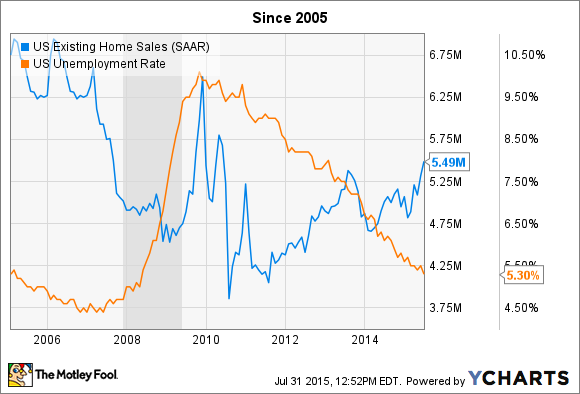 US Existing Home Sales data by YCharts. As you can see from the data above, the housing market has strengthened so far in 2015, while unemployment numbers continue to improve. It may be too early to call this a sustained trend of sales recovery, but it does seem that falling unemployment numbers are correlating with gains in home sales. The National Association of Realtors has reported an increase in first-time homebuyers over the past several months, an important indicator going forward, as more millennials take the plunge. This demographic, so far, has purchased homes at the lowest rate of any generation in its age group since the Great Depression. However, it's looking like this is largely a product of this group -- the second-largest segment of the U.S. population behind baby boomers -- having some of the highest unemployment and underemployment rates, and that tide is slowly turning. All of that said to say this: Trex is getting the benefit as more people buy homes and invest in upgrades and repairs. Kaplan has said housing is more of a leading indicator, since less expensive upgrades like flooring and other indoor improvements often take priority over an expensive deck that often gets used only a few months out of the year. TREX Revenue (TTM) data by YCharts. However, management says that it has limited opportunity to expand U.S. distribution channels at this point, and is forecasting for 12% sales growth in the quarter it will report on Monday, versus the 20% growth in the most recent quarter. Not to discount the importance of continued gains in its core U.S. home-improvement markets, much of Trex's growth going forward will be a product of two key initiatives. Trex products are now carried in more than 40 countries, and Kaplan has called it "the fastest growing part of our business." So far the company hasn't broken out sales or offered any detail on the results, but at some point, it will have to break out these sales as they grow. Kaplan said the following on the last earnings call, when pressed by an analyst: "I'll let my CFO decide when SEC rules require that it be broken out separately, but it won't be long at the rate that it's growing." Trex also has moved into the recycled polyethylene pellet business recently, leveraging its core strengths in both manufacturing (it already makes these pellets for its own use in manufacturing) and sourcing used polyethylene film and other materials. And while some have seen this as a move that will hurt profit margins because of the commodity nature of that business, Trex management has a different view. To start, its current business is quite seasonal, based on the building season for decks, and for a manufacturer, seasonality causes inefficiency, due to the nature of its fixed manufacturing costs. The company can smooth out the "lumps" in its manufacturing business and better leverage those fixed costs, or so it seems, by adding more pellet production, and selling this recycled product to film and bag manufacturers. The company also says that this market is relatively underserved, and it's a great space where it can diversify but within things the company is already very good at. This new business is expected to be worth between $50 million and $80 million in incremental revenue by 2017 or 2018. It's not clear how much more we will learn about the two growth initiatives above, but be sure to listen closely to what management says about the core business, and any additional opportunities to grow. Wall Street analysts expect $137.5 million in sales, which is more than the $136 million the company forecast, and $0.60 earnings per share, which may or may not be reasonable, depending on the impact of any capital investments for the pellet manufacturing business on profits. Overall, the company continues to excel at keeping costs down, and has made huge strides in distribution. As long as the economy and housing market remain strong, Trex's results will probably follow suit. We'll find out for sure in a few days.